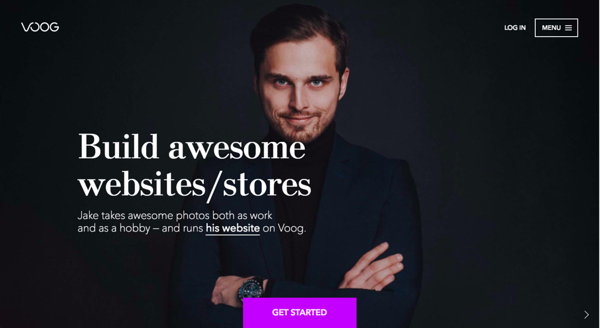 Back to "Setting up your account"
The fastest way to sign up is by simply clicking on the 'GET STARTED' button at http://voog.com. You're directed to our choose-a-design page where you can choose an initial template to get started with your site. When you've chosen a suitable template, you'll have to provide a minimal amount of information so we can get you started right away. Please make sure that you enter a valid e-mail address because this will be used as the main contact regarding all notifications, monthly reports and important updates about your website. In case you ever need to change it, you'll just have to invite a new user to the site with your new e-mail address. Second, come up with a good password that will always keep your account safe. And third, choose a technical address for your website. Technical address will be the initial URL for your Voog site and it will always remain connected to it. You can easily add a custom domain name afterwards and keep the technical address as a private, backup URL to your Voog site. As you complete the sign-up process, you will automatically activate a free 30-day Voog trial subscription. This means that you will be able to use Voog on a fully-upgraded level. Feel free to use these 30 days to get accustomed to our tool and to build up your website without having to worry about immediately ordering a paid subscription.